With a large family, we are continually going through hand towels in our kitchen. There are always messes to clean up, dishes to dry, and hands that need wiping. I wanted to create a tea towel design that had a cascading layout and was NOT an all over pattern. Almost as if the flowers and leaves were falling from the top of the fabric. I think the space at the bottom of the towel is delightfully different, and there are so many possibilities of ways to use that blank space (spoiler alert: I will be doing a future post on how to personalize these, so if you are not a subscriber, sign up here >>>). In this tutorial, I am going to show you how fun it is to create your tea towels using the cut and sew tea towel template pattern from my Spoonflower Shop. You can purchase the tea towel cut and sew fabric shown in this tutorial from my Spoonflower shop here, and order them either in a fat quarter size or in a yard, where you will get four tea towels per yard if you order the Linen Cotton Canvas fabric. These tea towels are best in print on the Linen Cotton Canvas, and the yardage is wide enough to give you four tea towels per yard. Spoonflower sends a nice detailed list of care instructions when you order from them, so follow the information they give you for best results with their fabrics. I printed the Mountainside Meadows Cascading Tea Towel Botanical design on the Linen Cotton Canvas (recommended - shown left), and the Mountainside Meadows Cascading Tea Towel Wildflower design on Kona Cotton (shown right) to try out the different fabrics. Once the printed fabric arrives, you need to wash and iron it first before sewing. I found it easier to handle my fabric and iron it by cutting out each tea towel from the large yard of fabric first. I just rough cut them out with scissors outside of the cut lines. Ironed tea towel template design before cutting. Next iron the fabric and get all the wrinkles out. Cotton fabric is somewhat stretchy, so the cut lines must be used as a general guide for cutting your fabric. This design needed cut lines because it is not an all over tea towel design. I folded my fabric in half and made sure to cut inside the lines. Then the edges will be aligned even if the material is not perfectly straight from the fabric stretching. I pressed my edges in with the iron folding in twice to hide the raw ends and pinned them all the way around to hold the fold in place for sewing the tea towel. Then I sewed the tea towels using a simple straight stitch all around the edge. Now you have a beautiful tea towel to use in your kitchen or give as a gift! I will be doing a future tutorial on how to personalize these, and a tutorial on how to design tea towels in Photoshop in upcoming posts with my best-selling Mountainside Meadows graphics set! The dimensions of the tea towels before sewing and finishing edges are 27 x 18 inches, the size of a Spoonflower fat quarter, and if you order a yard of the Spoonflower Linen Cotton Canvas fabric, you will get four tea towels on one printed yard. If you want to make one tea towel, order a single fat quarter! and bring nature into your kitchen with these botanical cut & sew designs, make them as a gift and impress your friends, and dry hands in style! 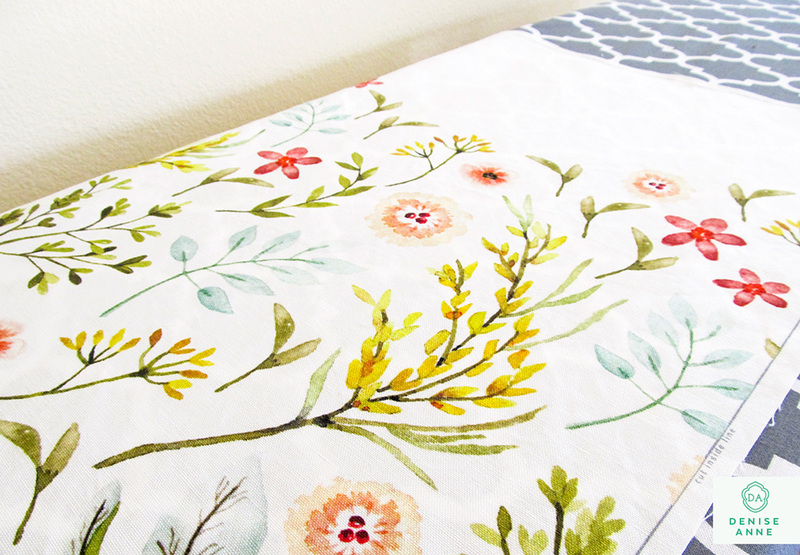 Shop these cut and sew tea towel fabrics right here on Spoonflower and start making!